Spring has sprung in North Herefordshire. Lord Tennyson once wrote “In spring a young man’s fancy lightly turns to thought of love”. Not for the cold-hearted Croft runners, whose innermost thoughts are tuned in to setting a P.B. on the historic Leinthall Starkes 5 course. The swallows were swooping over the Leinthall fields having journeyed many thousands of miles (a distance that would make even ultra-nutter Gemma Mallett quake with trepidation) from sub-Saharan Africa just to enjoy this springtime spectacle. Have you ever wondered why the swallow is the Croft Ambrey R.C. emblem ? Swallows and Croft runners are renowned both for their speed and endurance. Both are sleek and handsome creatures. Swallows arrive from glorious warm temperatures to the cold British conditions thinking “what the **** am I doing here ?”, much like many of the runners on the start line of this traditional season opener. Jan Ligema started the race, which for the third year was run in honour of the sadly-missed and much respected Mick Ligema, and Mick would have been proud of the man who shares his initials and claimed the Mick Ligema trophy for the 2nd successive year. Mark Lamonby stated his intention to set a fast time before he started and he proved to be a good tipster as he led every step of the way to smash over a minute from his previous best time. His time of 27.35 was the fastest on the old course for over 20 years and he now features at no. 4 on the all-time listings for an event that has been run for 32 years. Congratulations Mark – you are in prime condition and a high-quality Iron Man Triathlon awaits you. Gemma Mallett, just 2 days after running her 52nd marathon in the excellent time of 3.13 at Brighton, pushed her aching legs for another supreme effort to claim the female version of the Mick Ligema trophy. Gemma wasn’t able to relax at any stage as she was heartily chased by 2 first-timers on the course, both of whom had run the Manchester Marathon just 9 days earlier. Roxy Woodfield was second woman home in a time of 35.44, which takes her to no. 12 on the all-time female listings. Hannah Fletcher finished just 4 seconds adrift in a time that now places her 13th on the listings. Not too far behind was Jo Tilby, who sliced 1 min. 16 secs. from her P.B. and claimed the FV35 course record by 22 secs. in a time that now places her at no. 15. 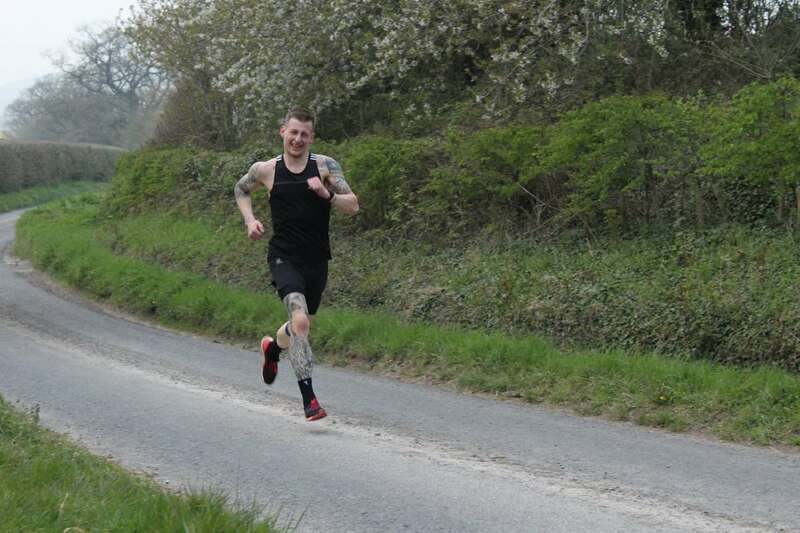 Jo is in training for the London Marathon at the end of April and looks set to record a good time. Back at the front of the race a young star was underlining his potential with a magnificent debut. 15 year old Scott Jones obliterated both the Under 17 and Junior Men’s (under 20) course records with an outstanding 2nd place in a superb 28.46. This breathtaking performance now ranks Scott at no. 9 above some pretty speedy runners. Another impressive debut came from Gareth Leek and his 3rd place time of 29.07 places him 12= in the rankings. It was great to see Stacey Morgan finish in 4th place as he struggles to get over his long-standing injury woes. He is still far from fully fit, but this return bodes well so long as there is no adverse reaction. Welcome back. There were numerous P.B.s – 10 in total – and 4 course records set on a still evening in ideal running conditions. Ian Price knocked a huge 1 min. 4 secs. off the MV70 course record and Liz Bowers set a new FV65 record with an exceptional 39.27. Will Gore continues his notable progress by carving over 2 minutes off his previous best. Lucy Wilding made the biggest improvement by hacking nearly 4 minutes from last year’s time. Apologies to you Lucy – I probably robbed you of a well deserved chocolate bar by failing to recognise this at the time. It was rewarding to see 13 runners making their debuts in the event and boosting the field to a record 41 finishers. You have set yourselves targets for next time. Remember one swallow does not make a summer ! The next event in the series will be held on Tuesday 7th May when the handicaps will be applied. The results are now published in the Results section.